Written and directed by David Cronenberg, eXistenZ is one of those films. It’s got a great science fiction concept, a quality cast (Jude Law, Willem DaFoe, Ian Holm) and enough mystery to hold your interest. I generally enjoy it and even find it strangely fascinating. Yet, it’s unsatisfying. And the more I think about it, the less satisfying it gets. The reason for this, sadly, is that Cronenberg has created a mess and he tries to cheat his way out of it. Before we go further, let me give two warnings. First, there will be serious spoilers, including discussions of the twists. Secondly, you can enjoy this film if you don’t think about it. So if ignorance is bliss, then skip this review. 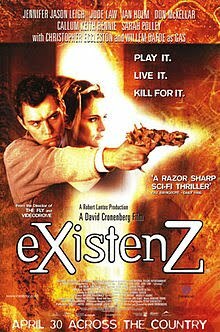 eXistenZ starts as the story of Allegra Geller (Jennifer Jason Leigh) and Ted Pikul (Jude Law), who are on the run from people trying to kill Geller. Geller is the world’s greatest virtual reality game designer and she has a new game called eXistenZ, the only copy of which is in her game pod -- a living game machine that ports into your body. Pikul is a marketing guy assigned to protect her. The people trying to kill her are a nebulous group of “realists,” who are waging a vague military style insurgency against her company for distorting reality. As they run, Geller’s game pod is damaged in an assassination attempt and she decides to test the game to make sure it still works. Inside the game world (“Cort-Stim world”), they discover a somewhat parallel world also with a violent struggle between virtualists and realists. Numerous twists and turns later, they return to the world in which the film started (“eXistenZ world”) only to discover that realists have launched an attack on them. This leads to a quick series of betrayals, which end when it is revealed that this world is actually a videogame called tranCendenZ and the people they’ve been running into are other players who are test marketing the game in the real world (“tranCendenZ world”). You should recognize this as the classic science fiction theme of a reality within a reality, as seen in films like Inception and The Thirteenth Floor. These stories work by blurring the worlds and causing the characters to lose track of which reality is real. Indeed, these films invariably end with some character asking “but what if this isn’t real?” eXistenZ is no different. It tries very hard to make us think the characters are losing track of what is real and what isn’t and it even ends on the line: “are we still in the game?” Yet, eXistenZ fails entirely to pull this off because it never presents anything to make us believe the characters could be the least bit confused about what is reality and what isn’t. Consider the “reality” in which most of the movie takes place -- Cort-Stim world. We know from the get go that this world exists solely inside a videogame and at no point is it ever suggested that this world might be real. Thus, the whole concept of having a world within a world is undercut from the beginning because both the audience and the characters know this is just a videogame. Further, there is no bleed through from one world to the other, there is no threat that can travel back and forth, and there is no possibility of getting stuck in Cort-Stim world. Moreover, Cort-Stim world is full of obvious game elements (like characters going into game loops) which don’t exist in eXistenZ world, and thus make it easy to tell which world is which. Despite this, Cronenberg tries to sell the audience on the idea of confusion by filling Pikul's dialog with comments about having a hard time telling the difference between the "real" world (eXistenZ world) and the game world. But this makes no sense. Pikul knows he’s plugged into a game and he’s only been playing for a few minutes. So why would he be confused? Also, to convince the audience that this confusion is real, Cronenberg has Pikul spend his time in the game being pensive about the dangers they are facing and asking repeatedly to leave the game before something bad happens. But this is as nonsensical as worrying about getting hurt in a car race game. Further, this game world bears no relationship to an actual game. It has some classic game elements, but it has no goals or objectives or instruction to players. It offers only one path to the players, with no choice to be made or tasks to be completed, and it lasts only a few minutes and ends with no possibility of victory. All in all, nothing about this feels like a game at all; it just feels like plot filler used to give the characters an appearance of doing something before the film ends, especially the supposed “game urges” which are little more than gratuitous sexual moments that have no purpose in the game (there is oddly out-of-place gratuitous gore too which you don't expect in this kind of film). eXistenZ world fairs no better. Things seem to happen randomly and much of it is unbelievable and contradictory. The attack of the realist in particular was poorly done. For example, you see them setting off explosions where there are no targets and firing wildly at nothing. Then one of the rebels declares victory, but against what? Then he decides to kill Geller, only Geller gets saved by a man who then tries to kill her, only to have another man try to kill her who has also saved her a couple times and could have killed her at his leisure many times before. Why does everyone who wants to kill her try to save her first? The explanation given by the final assassin is ridiculous: “I wanted to get to know who I was killing first.” Yeah, sure, so much for the dedicated revolutionary. A good example of this illogic comes from Willem DaFoe’s character. He decides to kill Geller to get a five million dollar reward. But rather than just kill her, he first agrees to install a bioport into Pikul. Why? Because he wants to install a defective bioport in the hopes of killing Geller’s game because there is a bonus reward for killing the game. But how does this make sense? If he kills Geller and Pikul as he plans, then he has the pod and he can burn it or shoot it or whatever. Why go through the elaborate hoax? Also, does it really make sense the people offering the reward would pay for a burned out pod or would they want to verify the game was on the pod? Also, how does he know they will play the game at his gas station so that he gets a chance to kill them after they play? And how does he even know this is the only copy of the game? Essentially, he has to know the plot before his actions make any sense. Pikul and Geller’s characters fall apart too once we learn eXistenZ world is a game as well. If this world isn’t real and Geller isn’t actually the designer of the game, then she has too much intimate knowledge of the game and of Cort-Stim world. Her knowledge goes way beyond what a first-time player would know. And if the object of eXistenZ is to kill Geller, why doesn’t Pikul just kill her the first chance he gets and win the game? Also, when she shoots her friend, why does Pikul lecturer her that she might have just killed a real human being? This is nonsense. Both Cort-Stim world and eXistenZ world are game worlds. So unless he's claiming confusion with tranCendenZ world, these couldn't possibly be real people -- and he never claims such confusion. The problem here is that the point Cronenberg is trying to make doesn't come naturally from the story's plot elements, so he's trying to force it by having the characters just say it. But that doesn't work. 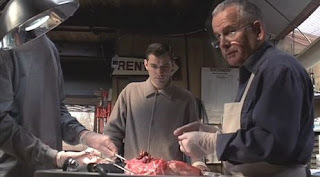 If the characters really are losing touch with reality, the film needs to show that through its story and the characters’ actions; the writer can’t just have the characters say “gee, I’m losing touch with reality.” What's happened here is Cronenberg made a mess of the underlying concept and he never bothered sorting it out before he made the film. Instead, he hopes to hide this fact by covering up the mess with forced dialog. This doesn't work. In fact, compare this with Inception, where the story methodically builds all the elements needed to let the audience question whether any of the worlds in which the characters find themselves can ever be proven to be real and leaves them wondering how the characters would actually know. If Cronenberg had bothered solving his plot problems rather than just covering them up, eXistenZ could have been Inception before Inception. I really wanted to like the film, and even gave it two tries. But I just couldn't sort out what was going on and why. I'm willing to take notes on a lengthy novel, but if I have to do that with a movie, it has already lost me. Lawhawk, I think you and I had the same thoughts on the film. It seems to be packed with all kinds of things going on -- so many in fact, that it becomes very difficult to keep track of exactly who is on what side and doing what and what means what to what. BUT, in the end, it's all bunk because none of it ever ties together -- it's just a veneer of a complex plot that falls apart the moment you start looking at it. I think ultimately, Cronenberg lost control of his material very early on and never bothered to make sure he pinned that down before he went ahead and started shooting. It's too bad, because the movie has tons of potential. I can't comment since I haven't seen the film and I'd prefer to avoid spoilers (even though I'll most likely forget them by the time I get around to watching the film). Cronenberg... what an enigma. I liked Videodrome, at least to the extent that I got it. I didn't get Naked Lunch at all but I should probably watch it again. And then there's Crash which was the first NC-17 film I ever saw. It's not a mind-bender, just weird but still oddly watchable. Ditto for Dead Ringers. Scott, Would it help if I mentioned a week or two in advance what films I'm doing next? I liked Videodrome, I didn't like Crash. I would characterize his career as trying too hard to be profound without ever actually saying anything profound. You can if you'd like though I kinda like the surprise! Scott, That's what I'm trying to figure out -- if people would rather know what's coming so they can see the film in advance or if they prefer the surprise. I think people would get more out of the articles if they get a chance to watch them first, but then I don't know if that really matters to people? I'm torn on this film. I think you're right in your criticisms, but I do kind of enjoy the film. I've seen it several times and there is something about the mood/atmosphere that draws me in. Although, I totally agree the film doesn't make a lot of sense when you start thinking about it and I also find it unsatisfying. You make an interesting point about this being Inception. That's a really good point that Cronenberg was close to doing something much more significant here. I'm in the same boat as Scott in that this one slipped by me, although I think I know why--nothing related to the film, just the time it came out. Ed, When I see this film, I see lost potential. I think Cronenberg had a great concept -- very timely as well with videogames getting more and more "real." He had a strong cast and a good eye for direction.... but he didn't do the mental heavy lifting to get his story in order. If he had, he might have run into a lot of different avenues that would have made this film really catch fire with the public. But he didn't. That's the lesson here. Jed, I think most people missed it (it only grossed $2 million in theaters) because it wasn't widely released or marketed. It came out around the same time as several other really interesting science fiction films that no one seems to know about either.... The Thirteenth Floor, Dark City and Cube. I do recommend seeing this film, even though I criticize it harshly above. It doesn't live up to what it could have been at all, but if you put that aside, it's still an interesting film and one science fiction fans should know. At first I misread the name of the film and I thought: "No way! They made a film about that E.D. drug? And Andrew...Andrew! Reviewed it? LOL! Ben, I've had that thought myself! LOL! Especially since the heroine's name is "Allegra" -- an allergy medication. I wonder if that was an inside joke? Actually, one of the writers was Hungarian and apparently the word "isten" means God in Hungarian, so that was the joke they were relying on. I take it you haven't seen this one either? I'd recommend it for sci-fi fans, but don't expect a great film. It's a good film that is well worth seeing, but like I say, when it's over you feel like "there's got to be something more".... and that feeling is the result of plot failure. "The people trying to kill her are a nebulous group of “realists,” who are waging a vague military style insurgency against her company for distorting reality." Really? The director, screenwriter(s), producer(s), (even well known actors in this case) etc....no one thought to question that this motivation doesn't even arise to the level of worse than weak? I mean, if not even a weak motive can be established for the films protagonists (or bad guys) then maybe, just maybe, the flick shouldn't be made. And of course this goes with the several other points you made, Andrew. These ain't just plot holes (which are irritating enough). There has to be a plot for that to happen. There's a premise and some interesting ideas, as you mentioned, but there's no coherent plot; no story that makes sense here. Sheesh! I can see why unknown actors or folks who are afraid of being fired for pointing out the obvious don't point this stuff out, but I can't see why the folks financing films like this, or actors who don't hafta worry about job security or the studio, etc., wouldn't say anything. Unless...they either don't care or they really did believe in it. Neither of which reflects well on them. There's also the possibility that some did say "this is crap, man! What the hell?" but were overruled. Is there a cameo by Jimmy Johnson? LOL! USS Ben, Nice pun! LOL! I agree entirely. You would think that somewhere along the way SOMEONE would have said, "wait a minute, this makes no sense?" I've found in writing (of all different kinds of styles, everything from fiction writing to legal writing) that when you find yourself having to fudge something, the reason is that you've got a serious problem you aren't addressing. That's the case here, as you put your finger on: if they can't find a real motive for the characters, then the plot just doesn't work. And indeed, in much of this film, you find yourself wondering what the motivations are supposed to me. Some people are realists, others are shouting "death to realism," but there's absolutely nothing behind either groups' supposed motivations, i.e. you never get a grasp of why it matters or why you (or they) should care. And that comes across in the pointlessness of many of their actions. 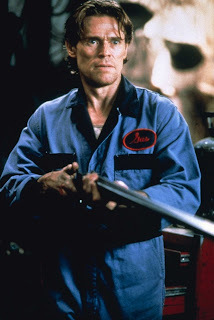 I think if Cronenberg (or his producers or whoever) had said, "wait a minute, answer some of these questions.... why is this happening.... who are they people.... why are we supposed to believe this" then they would have been forced to fix these issues and they might have turned this movie into something special. I really believe that. I have never seen a great movie that didn't have all of its ducks in a row and I've never seen an ok or poor movie that couldn't have been improved if they just fixed their own inconsistencies and gaps. This one had a lot going for it, it was just doomed from the get go. Aye! Definitely one of my favorite flicks! My only complaint about BTILC is it ain't long enough! Smiling Bob you say? LOL! I laugh because he's funny, in a creepy kind of way and hopefully at a distance. Ben, That's an interesting complaint! "Like Jack Burton always says..."
"Jack Burton. . . me!" Smiling Bob is one creepy dude. I agree that the commercials are funny, but I wouldn't go anywhere near this guy in real life! No way! Ben, Or... "Everybody relax. I'm here!" LOL! Andrew, this sounds like a film it would take me a very long time to wrap my head around. It kinda sounds like Inception, only not as good and twice as complicated. (Yes, I know you didn't like Inception.) Given this whole year has been me getting a headache from things I read, I don't think I want a headache from things I watch right now. Also, I loathe those Smiling Bob commercials. The only way I would enjoy those is if a pit bull or something came along and bit his...um, maybe I've said too much. T_Rav, Inception is definitely better. I had a lot of issues with Inception, but it was an eminently watchable film. This one is watchable and it's not as difficult to wrap your head around as it sounds. It's more a matter of just having a lot of loose ends flapping around all over the place. When you watch the film, it actually feels pretty simple because you aren't stopping to ask whether something makes sense or not. It's when you start thinking about it that you keep finding yourself saying, "wait a minute, that doesn't make sense." What I think is rather tragic is that this film could have been so much more if they'd just stopped to sort out their plot holes. I find smiling Bob to be pretty creepy personally. LOL! Aye! Virtually the entire movie is quotable but Russell got some great lines. That is one film I would love to see a sequel to if they get John Carpenter to direct it and Russell to reprise his role. Wang too. I can't recall his real name at the moment but that guy did an outstanding job and complemented Russell perfectly. T-Rav: a pitbull would add lotsa laughs to that commercial, lol! Ben, It is definitely a very quotable film! And it's one of Russell's best -- it really fits what he does personality-wise. I would love to see a sequel. That's the kind of film that could make for excellent sequel territory because you could go anywhere with it -- it's mainly premised on the personalities of the characters.